The most popular carrier for transporting a kayak in the world, now includes the convenience of fold down. Proven J style kayak carrier creates more room on the load bar to transport more toys at the same time. P.F.D. Lever™ (Pull Fold Done) - rapid folding for improved overhead clearance when not in use. NEW J profile for easy boat loading – best clearance of any J style carrier on the market. 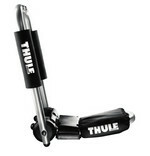 Fits Thule standard, Rapid Aero, Xsporter bars, Yakima®, and most factory installed racks. Includes two ratcheting tie downs, two straps and buckle protectors.